The term ‘Gopa Kuteeram’ (Sanskrit language) refers to the play-house of young Lord Krishna and the Gopas, His playmates of Vrindavan. So ‘Gopa Kuteeram’ signifies a place where children have enormous fun along with and in the presence of the Lord. 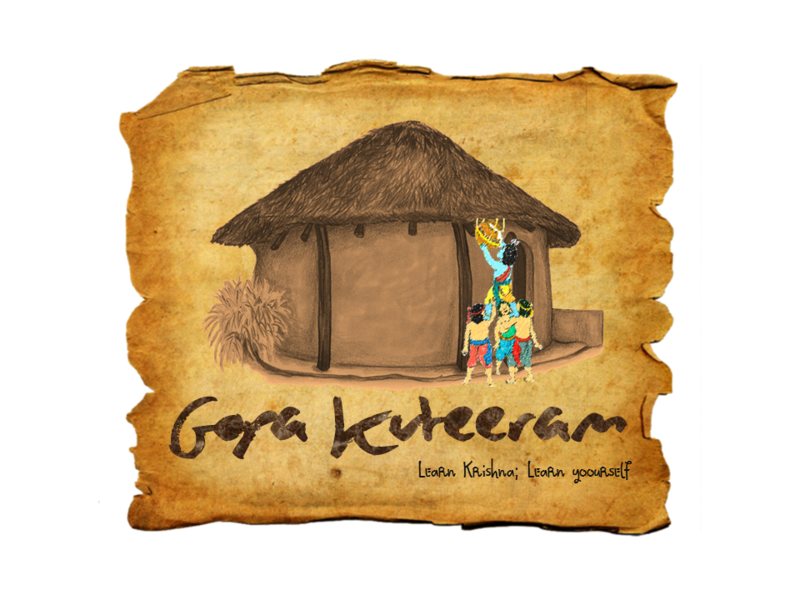 Gopa Kuteeram is an international children program. It aims to grow each and every child in Bhagavata Dharma which means making spirituality a part of everyday living. Spirituality and daily life are inseparable. Gopa Kuteeram shall aspire to facilitate the growth of the child in the flowering of Humanity & Divinity. 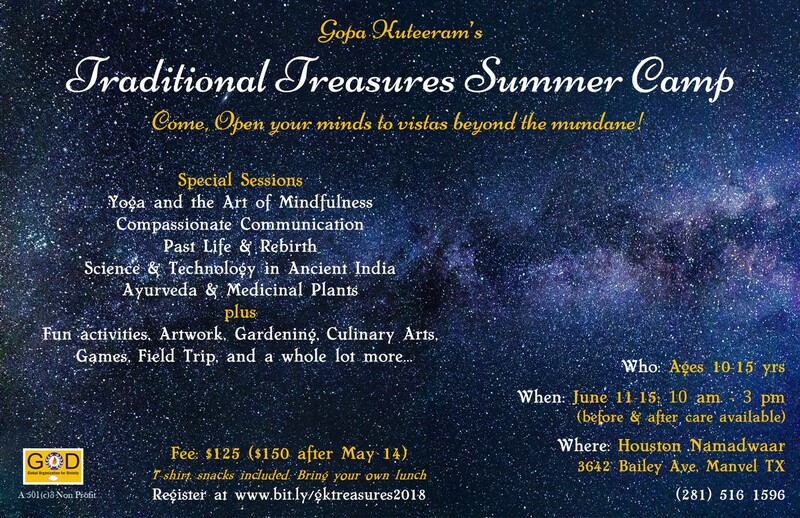 A weekly, bi-weekly or monthly Gopa Kuteeram program for kids/youth of all ages is conducted in several cities in the USA, Australia, India, Middle-East, Singapore, Indonesia, Malaysia and others. 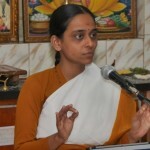 Weekly online e-Gopa Kuteeram classes for children aged 9 to 14 are also conducted in the USA. The program emphasizes on Spiritual, Emotional, Intellectual, Physical and Social well-being. The programs are also conducted in a fun, interactive way with lots of discussions, Q & A’s, role-plays, stimulating games, quizzes and more. If you have friends or relations here please ask them to join. Gopa Kuteeram Summer Camps are also conducted in different cities during the summer months. We call it the grand Sanatana Dharma. Why is it grand? How is it universal? Are spirituality and prosperity compatible? Are Science & Sanatana Dharma at odds? There are infinite ways to infinite bliss. Let’s find ours while accepting others. 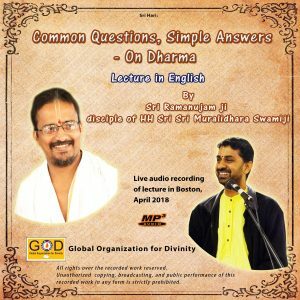 GOD USA is happy to release this life changing lecture by the esteemed Sri Ramanujamji, disciple of HH Sri Sri Muralidhara Swamiji, on the topic of Common Questions, Simple Answers – on Dharma. Be sure not to miss this! 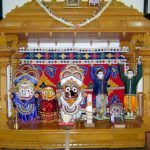 Experience the essence of Indian Culture through its values, creativity, lifestyle and ancient wisdom in Pearland/Manvel area of Houston. 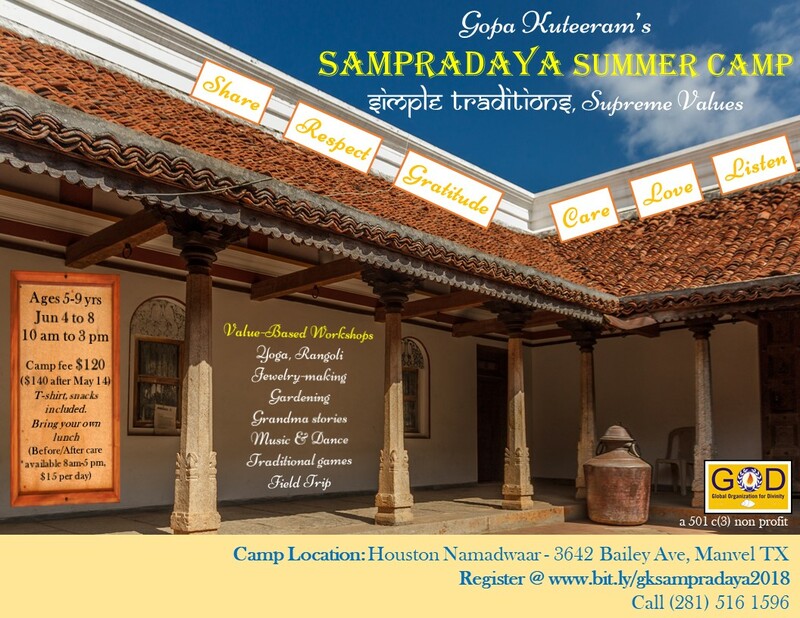 Indian culture and tradition themed camp with lots of fun and value-based workshops, activities, games and more. Yoga, jewelry-making, gardening, art of rangoli, traditional games, stories, music and dance, field trip. Featuring unique sessions encouraging young minds to think beyond the mundane and improve the quality of their lives. This camp will be an eye-opener for all youngsters in many ways. Fun activities including Ethnic Art, Gardening, Culinary Arts, Games, Field Trip and more. Call 281-516-1596 for more info. On this auspicious occasion of Akshaya Tritiya, GOD USA is happy to release “Mahamantra Kirtan” a 6-day exposition by Sri Ramanujamji in English of “Kali ka bhi kare samhaar”/“Kaliyayum bali kollum”, the divine work of H.H. Sri Sri Muralidhara Swamiji. 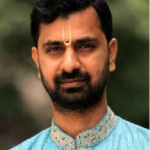 These discourses were recorded live during the inauguration of Dallas Namadwaar in March 2018. Special introductory offer: $15 for the entire collection (until Apr 25, 2018). After Apr 25, price will be $20.